- Believe it or not it had been three years since my last Pemi Loop in June of 2014, which was my sixth and first run of it. I have been itching to go back to see how much time I could take off of that run, 7 hour 33 minutes 49 seconds, and how close I could get to my ultimate goal of 6 hours 59 minutes. - All but one of my Pemi Loops have been in the clockwise direction, I decided this time to go counterclockwise because I feel the Bondcliff Trail is tougher to keep an aggressive descent pace as the trail becomes more eroded as the years pass by, where as the Osseo Trail below Flume is in incredible shape and safer for a faster pace. 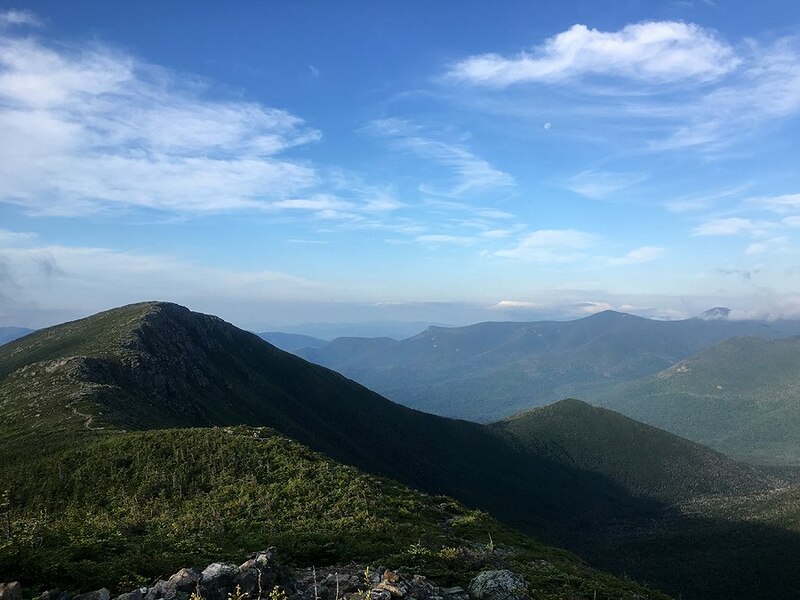 - My strategy for the run was to set an aggressive but not extremely-aggressive pace, with a goal of sub twenty minute miles until ascending Mount Garfield during the second half of the run. 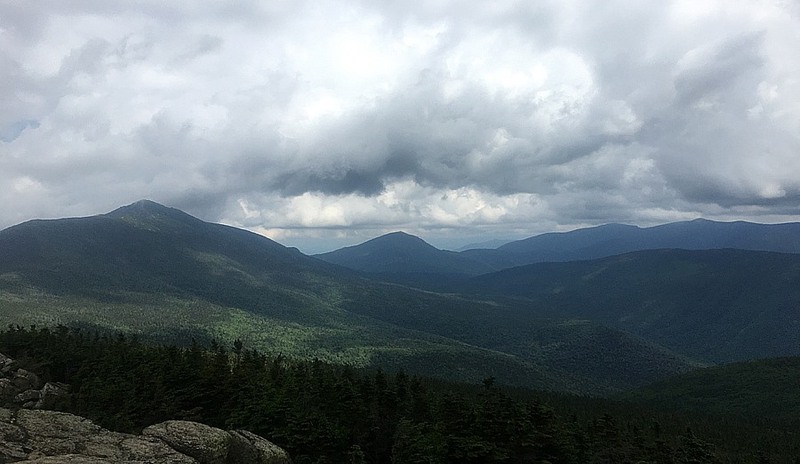 I also was not going to push the pace on any descents until later, basically I was saving my legs for the run out over the last 10.5 miles from Mount Lafayette to the finish at Lincoln Woods. - The weather looked great, albeit a little on the humid side, so I decided to start around 5AM to try and get in most of the run before the steamy weather set in. I started at 4:55AM, about a half hour before the sun officially rose but it was light enough to not need a headlamp and settle into a conservative pace, eight to nine minute miles, as I made my way over the old railroad grade until the Camp 16 turn on the Bondcliff Trail. I saw one other Pemi Looper about two miles in and wouldn't see another sole until a half mile away from Galhead Hut! - Past the Camp 16 turn, the Bondcliff Trail meanders for about a mile before starting to climb over an easy grade. As the trail heads up to Bondcliff there is only one steep burst, one semi steep section, but mostly easy to moderate grades. The speed hike up Bondcliff went by quickly and I reached the summit in 1 hour 48 minutes. 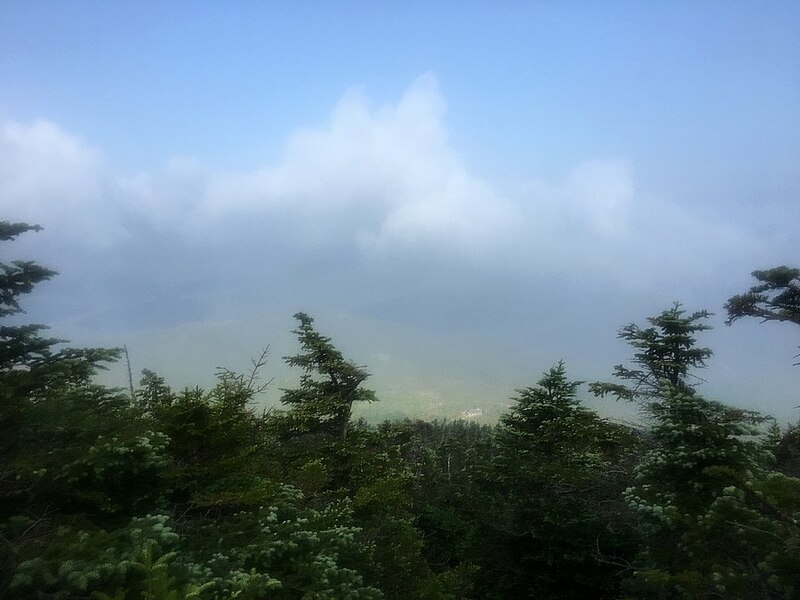 The weather at this point was very comfortable, and I made quick work of the easy down and up to the summit of Mount Bond in twenty minutes, 2:08 into the run. - Now came a real awesome section of hiking / running, the Bond-Guyot-Twin Range mini traverse, 3.5 miles. The footing is pretty good for most of it and the grades are easy to moderate for almost the whole duration. I set into a comfortable pace making it to South Twin in forty-four minutes, 2:52 into the run. - The drop down to Galehead Hut from South Twin, 0.8 miles and 1,200 feet on the Twinway, is one of the nastiest stretches of trail. Luckily the rocks were dry making for better than usual footing on the odd sized horrible boulders, and I made it to the hut in twenty-two minutes, 3:10 into the run. 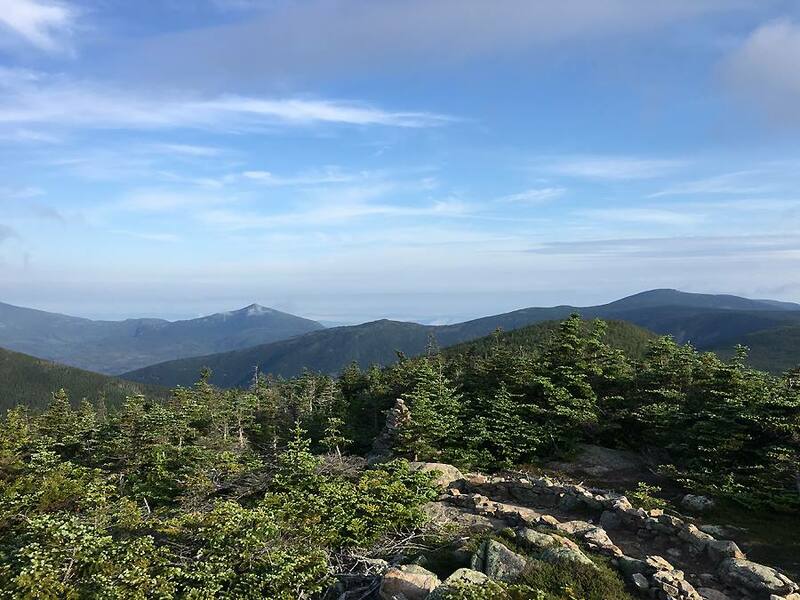 - At the hut I refilled my water and organized my fuel for the crux of the run, the Garfield Ridge Trail, what a nasty piece of work this trail is and has always been! Everywhere else throughout the day the rocks were dry and grippy, not so much on the Garfield Ridge Trail, they were sweaty and slick, I slipped four times throughout the 6.6 miles, not falls, just annoying slips, nowhere else throughout the day did I slip. To make things worse the humidity was starting to rise and there was also no wind, basically the trail became a steamy corridor. - The good news is I was still hitting all my time goals, as I passed by the Franconia Brook Trail junction I was 3 hours and 42 minutes in. Basically when you reach this point you double your time and that's what you'll be finishing in. So I was looking at a 7 hour 24 minute finish, but I was saving my energy for the finish so I set my sights on 7 hours 15 minutes. 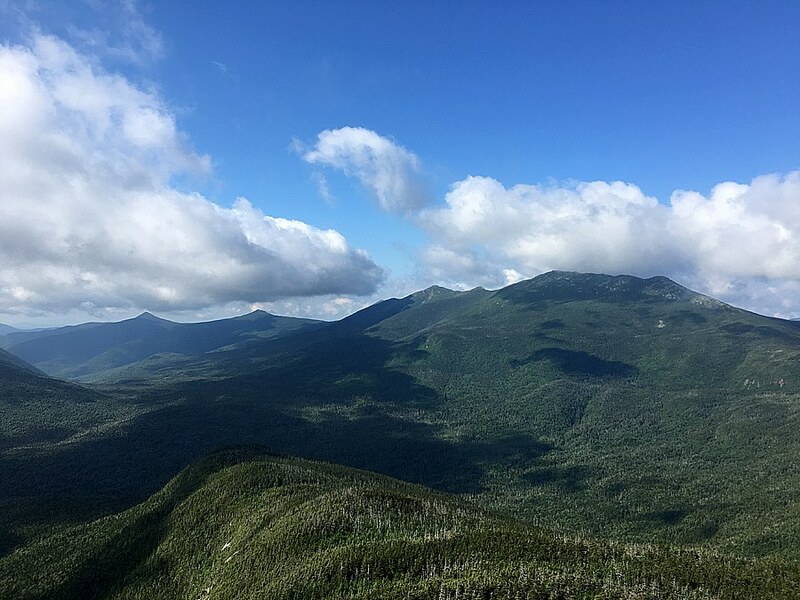 - Right past the Franconia Brook Trail junction is when the hardest part of the day starts, the mile climb up to Mount Garfield's summit, the highlight is the waterfall section of the trail as it's excessively steep. I "aggressively plodded" my way up this part, staying cool by dunking my baseball cap and head into the water that was bouncing off the rocks. This was my first twenty plus minute mile which was right on cue, and I knew I'd have another few twenty plus minute miles until Lafayette so I prepared myself for the conservative pace. 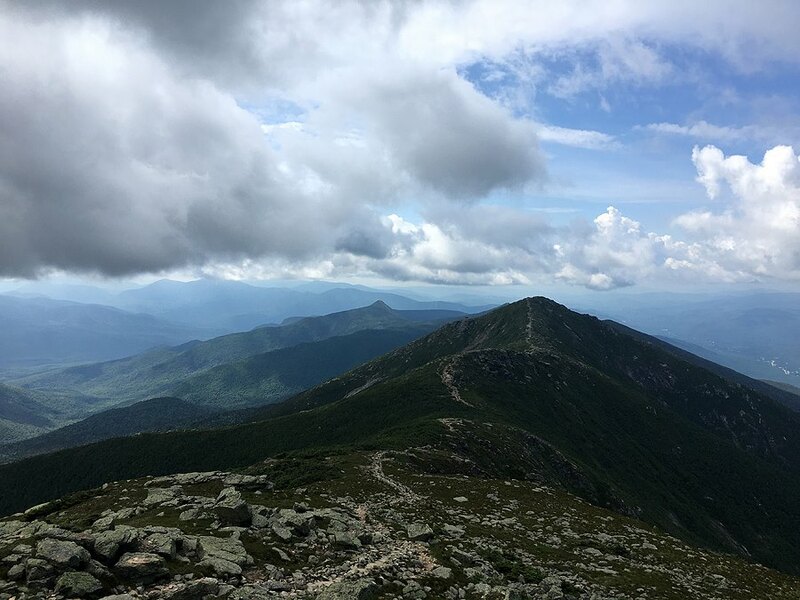 - I reached the summit of Garfield 4 hours and 5 minutes into the run, prepared my fuel for the next stretch, snapped a quick pic, and started the rugged descent down to Garfield Pond, followed by numerous up and downs, until the long steep climb up the northern shoulder of Mount Lafayette. 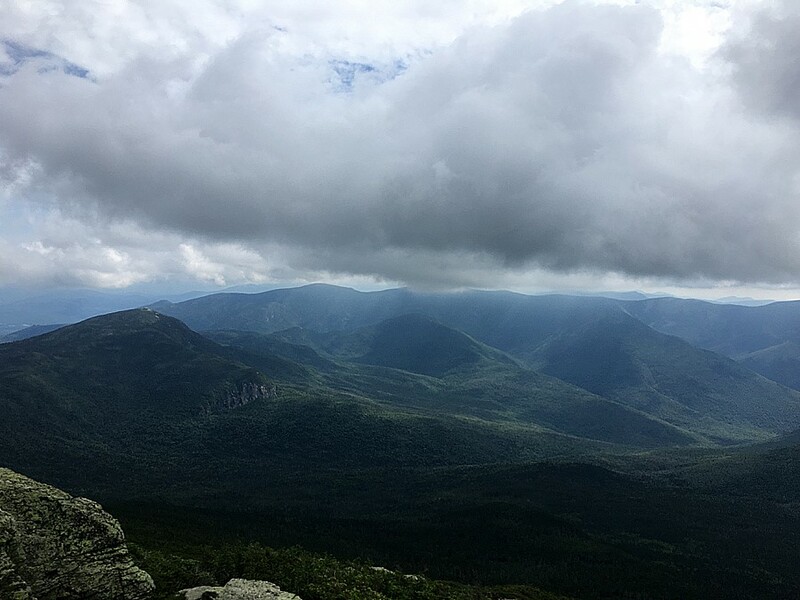 - When I popped out above treeline, a mile below Mount Lafayette, I was a little demoralized as there was no wind and it was quite steamy out, I knew this would drain a bit of energy so I was concerned about how my body would react when I tried to make up time across the ridge. Luckily, there was a decent amount of cloud cover so I wasn't being baked in the sun for more than a few minutes at a time. - Even with warm weather I still was feeling pretty good, although my stomach was starting to feel a little squeamish with the gels, gummies, waffles, and jelly bean fuels I was consuming. I'm not a huge fan of these, but eating solid food when going fast doesn't work for me, I did bring some jerky and chips which hit the spot when consuming them in very small portions. 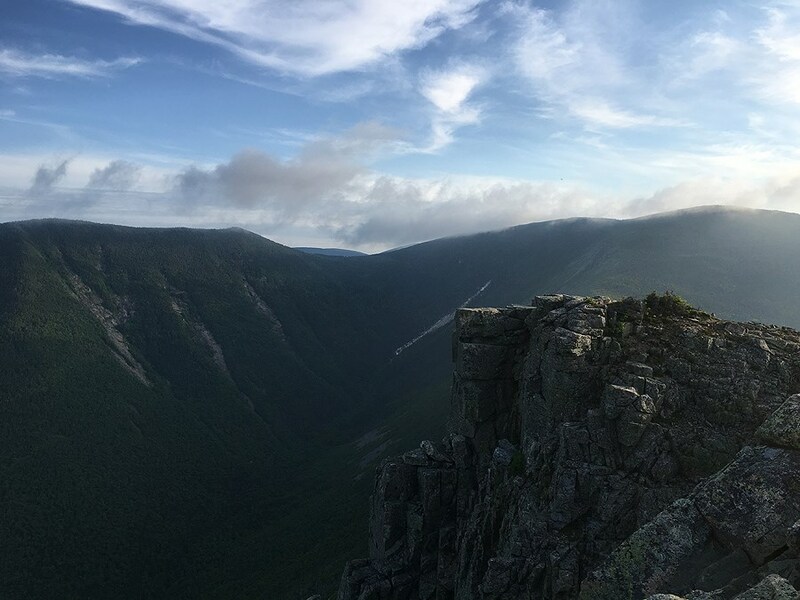 - 5 hours and 12 minutes into my run I stood on top of Mount Lafayette, 10.5 miles left of mostly excellent footing and three minor ups remaining (Lincoln, Liberty, Flume). 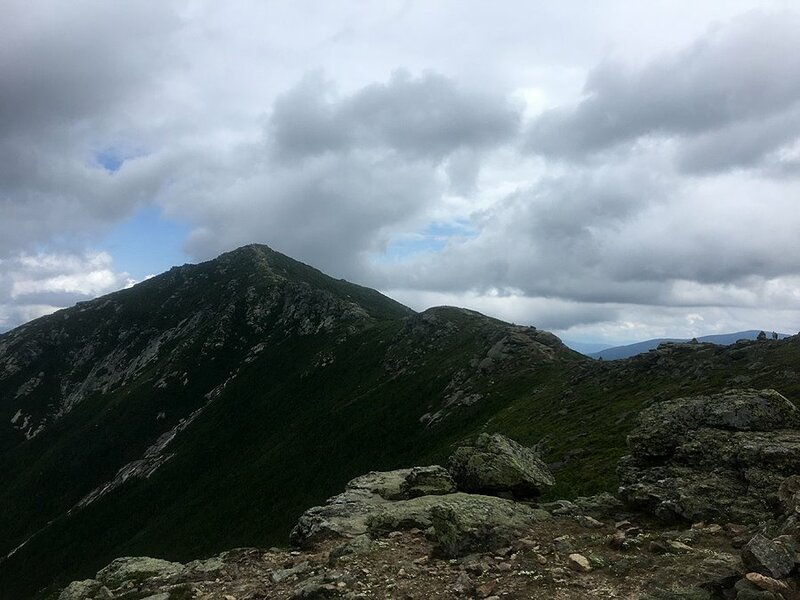 - The Franconia Ridge was busy, but being it was a Wednesday it wasn't too bad and I had no issues going at the pace I wanted to. 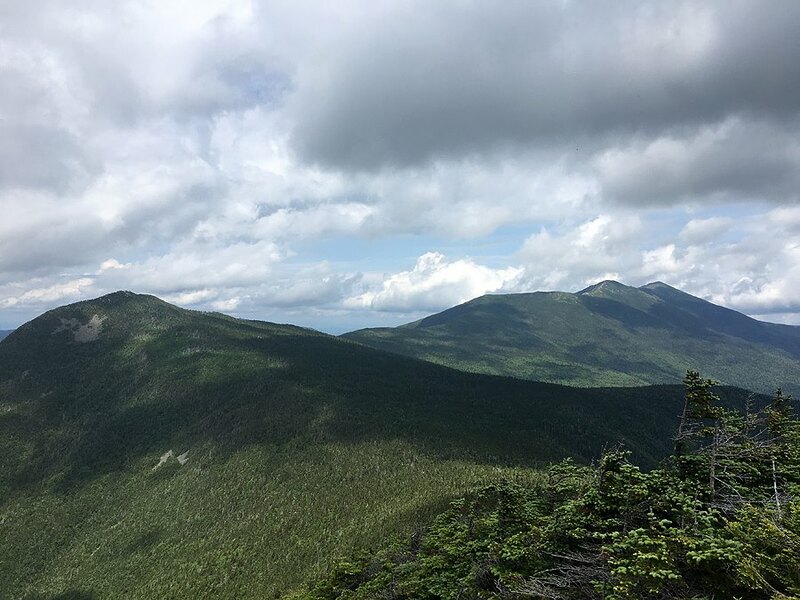 I made quick work of Mount Lincoln, going over it seventeen minutes after I left Lafayette, 5:29 into the run, and then zoomed past Little Haystack and back into the woods away from the crowds. 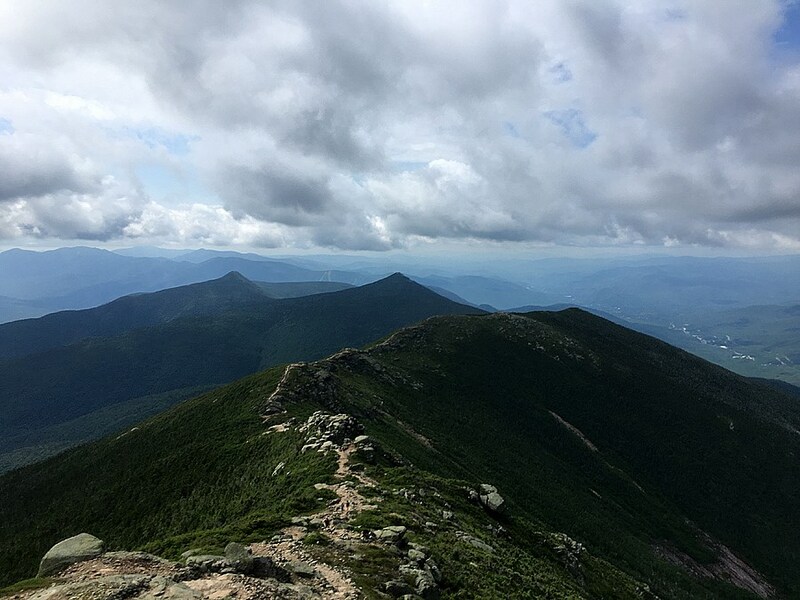 - The run over to Liberty went ok, with the humidity getting worse I wasn't able to go full throttle but still made excellent progress reaching the summit thirty-six minutes after passing Mount Lincoln, 6:05 into the run. One more mountain to go, Mount Flume! 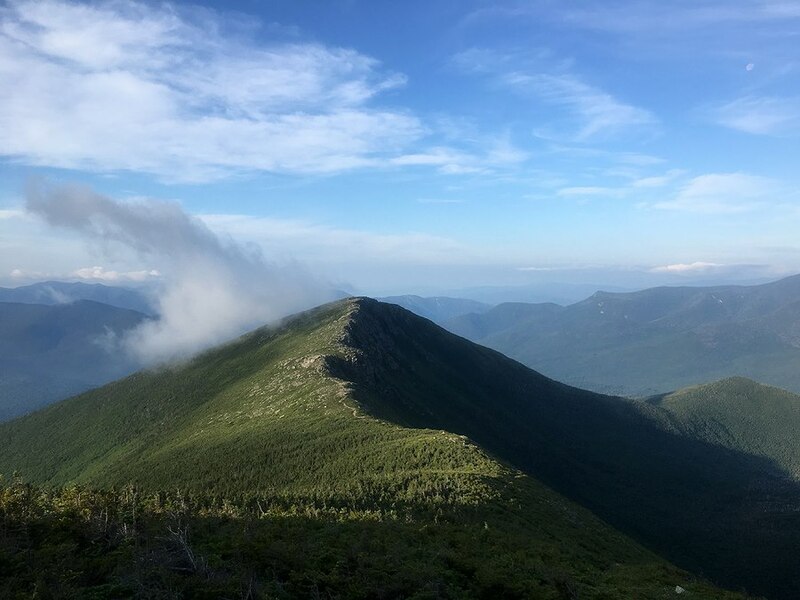 - I couldn't wait to get to the summit of Flume as I was really looking forward to not having to climb anymore, it was an easy down and up as it took twenty minutes, 6:25 into the run. - Now it was time for 4.1 miles of down followed by 1.4 miles of flat. I had to cover the 5.5 miles in 50 minutes to reach my goal of 7:15. 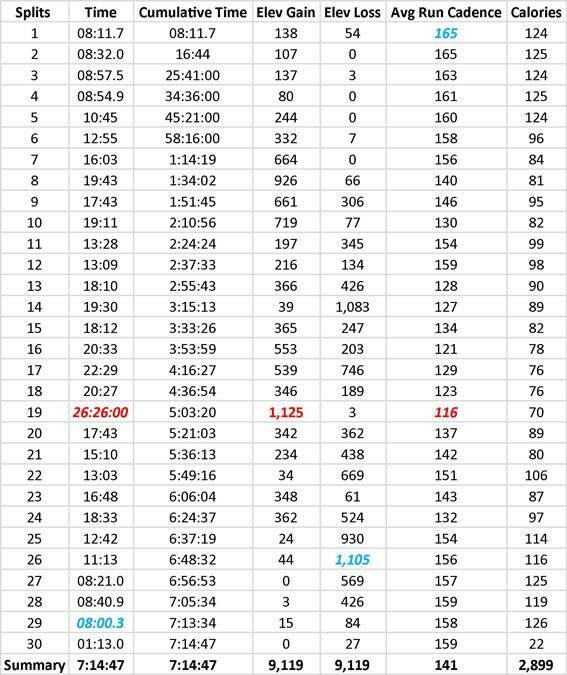 I knew my last 3.5 miles I'd be able to average 8:30 minute miles so it came down to the first two miles of the descent, I needed to average 12:30 miles until the terrain allowed me to really open up my stride. - I was teetering on the edge of my goal, but as I kept descending I knew I'd be within thirty seconds on either side at the current pace, therefore I would be able to swing that into my favor over the last mile to sneak in under 7:15, and that's just how it worked out as I crossed the bridge and stopped my watch as it read 7:14:17! - As soon as I finished I wobbled down to the river and submerged myself into a nice swimming hole, sitting there for a good fifteen minutes before shuffling back to my Jeep, to change my clothes and head home. On the summit of Mount Bond looking towards my upcoming route, South Twin and Garfield. They look so far away! Awesome! I just love reading your reports, especially the way you make your feats seem so normal and the fact that you can pull them off while still taking the time to enjoy the scenery, keep track of everything, and take such killer photos! First, thank you for you efforts on this blog. It is a very helpful resource for anything I do in the Whites - Please keep it up! - Great pics too. Okay, I did the Pemi back in 2015. It was rainy and not too humid. But, I still went through 2.5 liters of water after Galehead Hut. So the question is, how much water did you go through after Galehead on a very humid day? Glad my reports are a helpful resource for hiking in the Whites, thank you! As far as my Pemi Loop went, I actually went with a small amount of water post Galehead Hut, 1.5 liters of water in my pack and 20 ounces of water with a nuun tablet in my handheld bottle for electrolytes. I hydrated a lot leading up to the run, starting the day before, this along with the knowledge of terrain, where I could push the pace and where to slow down was a big factor in being able to pull this off with only minor stomach queasiness post run. Obviously, I wouldn't recommend this method! You can always top off at the Garfield Spring along the way, very good source and easy to filter, it's not that far from the hut but it doesn't hurt to fill back up, who knows, maybe this gets you to have water until half way down Flume where it's easy going back to Lincoln Woods. I would also suggest having Gatorade powder, Nuun tablets, or whatever you like to help replenish electrolytes. Some hikers/runners use salt tablets too, I've never used them but friends of mine have and were thankful to have them packed away. I have bonked before, it was a combination of lack of sleep and not fueling myself correctly. Since then I try and bring a wide variety of stuff to nibble on, whether it be candy bars, chips, beef jerky, etc. I have noticed that helps. 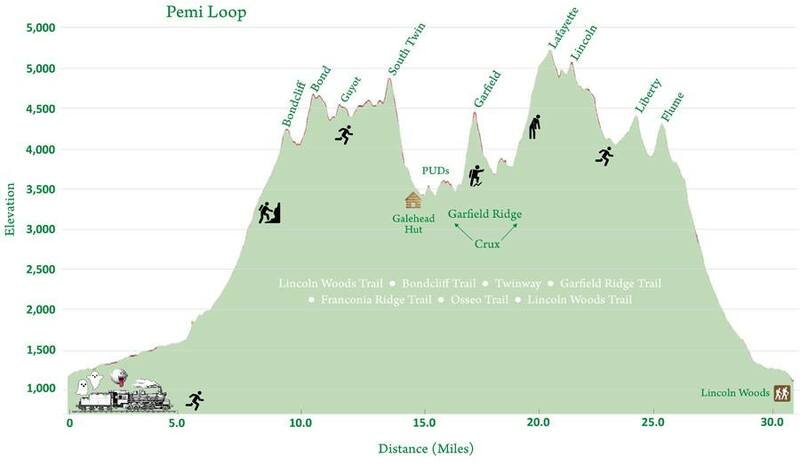 Years ago during my first one day Pemi Loop, which took around 15 hours, I went clockwise and drank 3 liters of water from Lincoln Woods to Galehead Hut, from there I drank about 2.5 Liters. I must have drank 32 ounces of Gatorade too. I was not going fast so I brought all types of food with me too. Very enjoyable. Hope this helps a little bit, and you don't run out of water this time and have an enjoyable finish over and out from Flume. Let me know how it goes! Good info - thanks for the quick response. You hit on something very important that I need to pay more attention to - Hydrate better the day before. I need to drink more in the hours leading up to big efforts like the Pemi. Obvious I know, but it 'ain't gettin' done. I'll let you know how it all goes down. 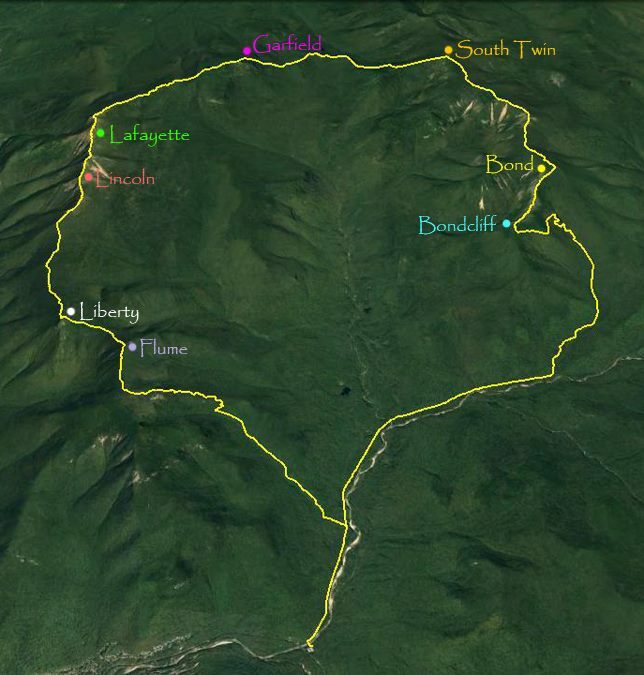 Just did the Pemi yesterday (Aug. 6) counter clockwise in a skosh under 11 hours. Very good conditions for the effort: 50 – 70 deg. F & low humidity. The only exception: Killer winds at the peaks – even a little on the cold side at the Bonds and Lafayette (shoulda brought gloves). Water: 1.5 liters Lincoln Woods to Galehead Hut. 2.5 liters Galehead back to Lincoln Woods. On a humid day I’d expect to go through 3 liters or more. Food: Ate a Mountain House Breakfast Skillet Freeze Dried camp meal at 4am before starting at 6am. Liberty: 1 Salt Stick Tablet – the coolish temps kept the sweat down so didn’t need anymore. I took breaks of 10-15 minutes at Bondcliff, Galehead Hut, Garfield, & Lafayette just to give the legs a breather and take pictures. Oh Yeah – I made sure to take note of where I was on the loop when my watch hit 7 hrs 15 min…About ½ way between Garfield and Lafayette. Chris – you are fitter than fit. Keep blogging to inspire us mortals! Excellent, and congrats on another Pemi Loop! Thanks for providing the detailed info about refueling and water, hope some of the readers of the blog will see it and use it to help them plan their one day Pemi.